Looking at the 2015 Las Virgenes Stakes; Casey’s Picks: The Las Virgenes has been a fantastic three-year-old prep to launch fillies into a phenomenal career. 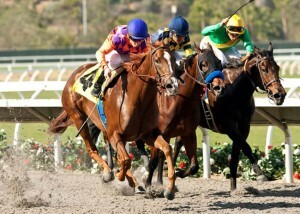 Last year, the winner was Fashion Plate who went on the win the Santa Anita Oaks. Before her came Beholder, second in the Kentucky Oaks and winner of the Breeders’ Cup Distaff later that same year, over Princess of Sylmar and Royal Delta. Other names listed in the win category of the Las Virgenes include Zazu, Blind Luck, Stardom Bound, Rags to Riches, Balance, You, Surfside, Sharp Cat, and Serena’s Song. If these names aren’t enough to take notice at this race as a very important Kentucky Oaks prep race, nothing is. Points toward the Kentucky Oaks are distributed 10-4-2-1 to the top four fillies to cross the wire. The race is set to run Saturday, January 31, 2015 at Santa Anita in Arcadia, California. Maybellene (center) and Light The City (far right) along with Callback are Casey’s top three picks for the G1 $300,000 Las Virgenes Stakes for three-year-old fillies at Santa Anita Park on Saturday, January 31, 2015. Glory (Tapit o/o Ki Maniere (IRE), by Sadler’s Well)– breaking her maiden last out going 6.5F, this Tapit filly has a nice pedigree to be able to stretch out to the 8F distance. Her connections upon this entry should help her as well. Hollendorfer usually doesn’t enter a horse unless he is certain they have a chance at winning. This filly has the pedigree, but lacks some experience that other fillies have. Making her stakes debut, I am not sure she is going to be exiting a Grade One winner. Maybellene (Lookin at Lucky o/o Greathearted, by Giant’s Causeway) – This filly may look like a cinch to some, as she is finally not running against Take Charge Brandi. Last out she was a very close third in the G1 Starlet, finishing behind Take Charge Brandi and Feathered. With the pedigree that is easily capable of getting her the 8F, which she has run further before, she should be one of the favorites, if not the favorite for this race. Lutine Belle (Bellamy Road o/o Timeless Trick, by Mazel Trick) – this Bellamy Road filly is coming into this race off a stakes win in the Blue Norther. However, that race was on the turf. 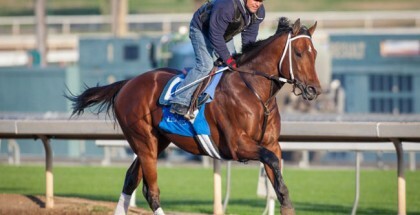 She has been working really impressively at Golden Gate and should be able to get the 8F distance. However, I am not entirely convinced she is the class of the field. 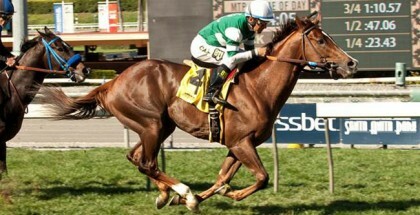 Can she win a stakes on dirt, let alone a Grade One? Achiever’s Legacy (City Zip o/o Lure the Bear, by Lure) – This filly has done most of her running on the turf, so why the switch to dirt to try a Grade One against better dirt horses, I will never know. However, Hollendorfer and Van Dyke seem to think the filly can. 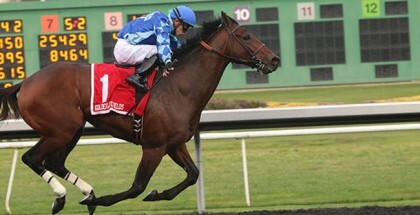 Her pedigree looks to be perfect for 8F. Her workouts are slow, all over dirt. Last out, she finished 5th in the Starlet. I don’t see why she keeps entering these dirt races, but maybe she can prove me wrong. Mio Me (Eskendereya o/o Missile Bay, by Yes It’s True) – Coming in off a maiden score on the downhill turf at Santa Anita, this filly is trained by Woodbine sensation Mark Casse, who is known most recently for the success of Conquest Stables racing. If she can transfer her form to the dirt, maybe she can make a good run from the back of the pack. Her pedigree suggests that 8F is within her scope. She has to make a big step up to win this race. Majestic Presence (Majestic Warrior o/o Shining Victory, by Victory Gallop) – Breaking her maiden last fall going a mile, she should have no problem getting the distance, but her performances haven’t been what is expected of the filly. She was forth last out in the Starlet and third the time before in the Delta Downs Princess, both behind Take Charge Brandi. I would back her here, but fast workouts aren’t enough for her to have my faith again. Also, it looks to be a lack of speed, which her running style needs. Callback (Street Sense o/o Quickest, by Forest Wildcat) – Last seen trying to run Seduire down in the 6.5F Santa Ynez, Callback ran out of room. She was bred to be fast and be able to carry it decently. However, maybe the 9F of later races may be too far for her, the 8F could be easily reached, especially since she likes to run midpack and stalk. 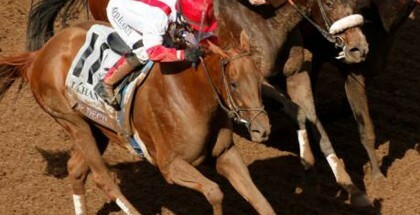 She got a wicked pace in the Santa Ynez and just didn’t have the room to run the winner down. I actually think she could run well here since she doesn’t sit too far off the pace. Suva Harbor (Rockport Harbor o/o Queen Dido, by Thunder Gulch) – In four starts, this filly has never been worse than second, but has never been outside the allowance ranks. She broke her maiden in her third try going one mile on the turn and followed it up with an allowance win going one mile on the dirt. Obviously able to handle distance and different surfaces, she is one to consider here. Pedigree suggests she should easily get the distance and her running style is likely favorite since there is not a lot of speed. Miss Mandate (Pioneerof the Nile o/o Baba’s Mandate, by Full Mandate)– In her last start, she was seen finishing second in the allowance race won by fellow entry-mate, Suva Harbor. Her pedigree suggests she should get the 8F, but she seems a step below some of these fillies and hasn’t run well in her career. I would look for her to be close to the lead, and with the lack of speed, she may even be on it. If she can break through here, it would be surprising. Light the City (Street Sense o/o Light From Above, by A.P. Indy) – This filly has only been off the board once in four career starts. If you were to throw out her 5th place finish in the Santa Ynez, she has two wins and a third to her credit. In her second start, she actually defeated Seduire in the Anaokia Stakes at 6F. This filly is bred to run further than the 6F she last won at. She likes to be near the lead but doesn’t need it. Casey’s Opinions: The field is actually a really tough one to handicap. I like Maybellene now that she is free from Take Charge Brandi and her pedigree is perfect for this race. She may struggle with the little bit of a lack of true speed in here, but she should be able to adapt. She is pretty experienced compared to some of the fillies and has a class about her. I also like Light the City, who has beaten the highly regarded Seduire in a stakes. However, she may not be who she really seems to be, as all her races have some in small fields. I also like Callback and she should run well after hitting the board last time at 17-1. She has a lovely pedigree and should carry her well.